“One summer, when there was a great drought at Fredriksstad (Norway), the following words were posted in a W.C. ‘Don’t pull the string for bimmelim, only for bummelum‘. This was immediately understood” (Jespersen 1933: 284). Lewis Carroll 1976. Complete Works. New York: 211. „Must a name mean something?“ Alice asked doubtfully. 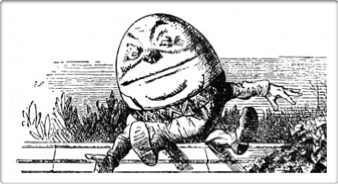 „Of course it must,“ Humpty Dumpty said with a short laugh: my name means the shape I am“ (Carroll 1976: 209). Various studies discuss that the level of sound may carry information. They usually refer to the meaning of individual sounds. Today, however, sound symbolism is used for phonetic features, tones, phonemes, combinations of phonemes or complex sound structures that repeatedly activate complexes of associations so that they relate to aspects of meaning. Sound symbolism includes sound imitation/onomatopoeia (ping pong, bang! ), terms for feelings (ouch!, oh! ), or syn(a)esthesia, stimuli and additional response from different senses like hearing colours or letters triggering tastes, e.g. snap! Hinton/Nichols/Ohala (1994) differentiate between four types according to degree of linkage between sound and meaning. Corporeal sound symbolism is based on an emotional or physical state and usually is not coded linguistically, e.g. sneezing or ouch!. Imitative sound symbolism refers to imitations of sounds, cf. ssss for the hissing of snakes. It is partly conventional, cf. bang!. In synaesthetic symbolism non-acoustic phenomena are represented linguistically, e.g. i - ‘smaller', a - ‘larger'. Finally, conventional sound symbolism results from repeated groupings of meaning and form. It is language specific, acquired, but according to Hinton et al. shows universal traits (gl - glimmer, glitter, glim). Alongside sound symbolism we find the terms phonetic symbolism, phonosemantics, phonesthesia. Ever since Plato the "natural" meaning of words was subject of dicussion. Later, Jacob Grimm, Wilhelm von Humboldt, Hermann Paul, Wilhelm Wundt or Otto Jespersen reflected upon sound symbolic effects. In the beginning of the last century first experiments were conducted, and several studies were published in English, German and French. But only recently sound symbolism became relevant especially for the psychology of advertising. Subjects tend to relate similar sounds or sound structures to associations and ideas, thus intentional use of certain sounds in names may influence the idea of form, size, brightness of the object named, and it might allow to infer properties, e.g. the name Hoover for a vacuum cleaner that gently purrs, but does not rattle. Today we want to discover how and why sound complexes have to be designed to trigger certain association bundles. Example of synaesthesia: Köhler's maluma-takete-experiment. Subjects had to match words and drawings. Apparently they decided because of similarity relations. The relation between sound and meaning is arbitrary - this is not always true. Language users repeatedly perceive relationships between sound patterns and associations. This project investigates the sound symbolic effects of words. Sound symbolism means, that units of sound may carry features of meaning. Therefore they influence formation, change, acquisition, use and intrerpretation of lexemes. How can we make use of sound symbolism in teaching language? Why do the languages of the world differ in the percentage of sound symbolic vocabulary? In how far are invented languages (conlangs) sound sybolic? Do Turkish native speakers react differently from German or English ones? Dingemanse, Mark, Blasi, Damián E., Lupyan, Gary, Christiansen, Morten H., Monaghan, Padraic 2015. Arbitrariness, iconicity, and systematicity in language. Trends in Cognitive Sciences 19.10. 603-615. Elsen, Hilke 2008. Phantastische Namen. Die Namen in Science Fiction und Fantasy zwischen Arbitrarität und Wortbildung. Tübingen. Elsen, Hilke 2014. Lautsymbolik - ein vernachlässigter Forschungsgegenstand der Sprachwissenschaft. Glottotheory 5.2. 185-218. Elsen, Hilke 2016. Einführung in die Lautsymbolik. Berlin. Elsen, Hilke 2016. Wirkendes Wort - wirkender Laut: Lautsymbolik in den Sprachen der Welt. Wirkendes Wort 3/2016. 479-489. Elsen, Hilke 2017. Die beiden Gesichter der Lautsymbolik. Muttersprache 3/2017. 153-162. Elsen, Hilke 2017. Lautsymbolik als Verarbeitungshilfe. Deutsch als Fremdsprache 4/2017. 231-239. Elsen, Hilke 2017. Ist das Phonästhem eine morphologische oder eine lautsymbolische Erscheinung? Zeitschrift für Wortbildung / Journal of Word Formation 2/2017. 9-29. Elsen, Hilke 2017. The two meanings of sound symbolism. Open Linguistics 2017;3. 489-497. doi.org/10.1515/opli-2017-0024. French, Patrice L. 1976. Toward an explanation of phonetic symbolism. Word 28.3. 305-322. Hinton, Leanne, Nichols, Johanna, Ohala, John 1994a. Sound Symbolism. Cambridge. Imai, Mutsumi, Kita, Sotaro 2014. The sound symbolism bootstrapping hypothesis for language acquisition and language evolution. Philosophical Transactions of the Royal Society B: Biological Sciences 369.1651. Nuckolls, Janis B. 1999. The case for sound symbolism. Annual Review of Anthropology 28. 225-252. Peterfalvi, Jean-Michel. 1970. Recherches expérimentales sur le symbolisme phonétique. Paris. Whissell, Cynthia 2000. Phonoemotional profiling: A description of the emotional flavour of English texts on the basis of the phonemes employed in them. Perceptual and Motor Skills 91. 617-648.